PATTADAKAL TEMPLES pattadakal temples - Shiva Maha Purana, Vishnu Purana, garuda purana, bhavishya purana, skanda purana. On the left bank of Malaprabha river lies the world heritage centre of Pattadakal. Like Aihole and Badami, Pattadakal is noteworthy for its beautiful early Western Chalukyan temples. They belong to the time of Vikramaditya II (whose art loving queen Trailokyamahadevi reverently named the deity after herself). Pattadakal, or ‘Pattada Kisuvolal’, as it was known once, is now a popular village in the Badami taluk of Bijapur district. There are ten temples of both Dravidian and Northern styles, and hundreds of inscriptions. The rest of the temples, both big and small, seem to have been razed to the ground partly due to the effects of nature and partly by the vandalism of the ignorant villagers. These existing remains are a testimony to the fact that Pattadakal was an important religious centre and a flourishing city during the days of Early Western Chalukyas from 500 to 757 A.D. It was the second capital of the Chalukyas and the coronation ceremonies of their kings used to take place here. Most of the temples at Pattadakal were built during the times of the Early Chalukyas. The name of Vikramaditya II is very intimately connected with beautifying the city of Pattadakal. This place has the distinction of being the meeting point of South Indian and North Indian architectural styles and cultural contacts, as can be seen from the temples of the place. There is an interesting 8th century Sanskrit inscription at Pattadakal written in both South Indian and Nagari scripts. Noted architects like Gunda, Sarvasiddhi Achari and Revadi Ovajja built the temples at Pattadakal. Sculptors like Chenganna, Baladeva, Deva Arya and others embellished the temples by their fine sculptures. 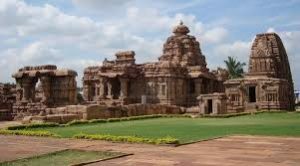 The fact that Jnana Shivacharya, a scholar from a principality to the north of Ganges had come and settled down at Pattadakal indicates the cultural contacts that had been established between the south and North India in those days. Among all the temples at Pattadakal, the temple of Virupaksha is the largest and the finest. Facing east, it stands close to the village. This is an exquisite specimen of the Dravidian style of architecture. It was originally called the Lokeshwara temple, named after Lokamahadevi. It has a large court and a fine hall for Nandi, which has an effigy of golden Ganga. The porch on the eastern side has two pillars decorated with amorous couple. Flanking the entrance are two large Dwarapalas, three eyed and carved with a trident to suggest their association with Shiva. An inscription on the porch says that the architect Suthradhari Gunda constructed this temple in 740 A.D., for Lokamahadevi, sister of Trailokyamahadevi, to commemorate the conquest of Kanchi by Vikramaditya. It is built after the pattern of Kailasanatha temple at Kanchi. Near the eastern gate is the Nandi ‘mandapa; housing a huge sculpture of Nandi, beautifully executed in black stone. Against the courtyard wall, are a series of small cell shrines which in many cases have lost the images of gods in them. The outer walls bear fine pieces of natural life-like sculptural art. The important ones are Nataraja, Lakulisha, Lingodhbhavamurthi, Ardhanarishwara, Shiva and Parvathi. The hall of the temple has eighteen heavy square pillars supporting the roof. These pillars bear interesting basreliefs from the epics Ramayana, Mahabharata and Bhagavata. The beautifully perforated scroll patterned windows form one of the finest features of the hall. Within the shrine is the Linga of Virupaksha under worship. The three niches on the outer walls of the shrine do not contain any images. Mallikarjuna temple is adjacent to the Virupaksha temple and resembles it so closely to be called as twin temples. This temple is dedicated to Shiva called as ‘Trailokyeshwara after Trailokyamahadevi, the younger sister of Lokamahadevi and junior consort of Vikramaditya. Both these sisters who were born in the Haihaya dynasty had married Chandragupta. Even this temple was erected to commemorate her husband’s victory at Kanchi. Facing east, it is modelled after the Kailasa temple at Kanchi. As in the Virupaksha temple, the large hall beyond the porch has eighteen columns on which beautiful bas-reliefs illustrating episodes from Ramayana, Mahabharata, Bhagavata and stories from Panchatantra are illustrated. The shrine is decorated with beautiful bas-reliefs of Gajantaka, Lakulisha, Harihara and so forth. The ceiling near the antechamber of the shrine has sculptures of Shiva and Parvathi. The dome of the ‘vimana’ of this temple is circular unlike that of the Virupaksha temple which is square. The Kasi Vishveshwara temple near the Mallikarjuna temple faces east and is constructed out of dressed blocks of sand-stone. It is assigned to the 8th century. The temple has a ‘vimana’ in the northern style, but the Nandi mantapa is ruined and the ‘shikhara’ is lost. In its horse-shoe shaped ‘chaitya’ windows high over on the facade is Shiva dancing, with Parvathi watching. The marvellous sculptures on the columns illustrate scenes from Ramayana, Bhagavata and diverse forms of Shiva and Parvathi such as Ardhanarishwara, Tripuranthaka and Kalyanasundara. Sangameshwara temple, which was built in the early part of the 8th century is also nearby. This Shiva temple is dedicated to Vijayeshwara named after the builder of temple Vijayaditya. Though in large proportions, and simple, the temple is very effective. The sculptures are massive and they look unfinished and indicate that the structure was left incomplete for some unknown reason. The inscriptions merely indicate the name of the sculptor as Paka. The Galaganatha temple which is in the same area, is in the northern or Nagara style, assigned to the 8th century. The temple has towers at its four corners and in the centre of which the ribbed ‘amalika’ and Kudu are repeated at every level. The lintel on the doorway is carved with a dancing Sliiva and decorated with artistic designs. At the rear of Galagantha temple is the Jambulinga, also I acing east and in Nagara style of architecture. It is a shrine with a small ‘mandapa’ whose ceiling is lost, the well carved entrance is intact. The facade of the ‘vimana’ immediately above the entrance shows Dancing Shiva, with Parvati and Nandi watching. Kadasiddheshwara is another temple near Galaganatha temple, with Shiva and Parvati on the lintel of the doorway. II appears to have derived its present name from an ascetic who might have lived in this temple. The guardian deities in front of the temple are mutilated, and the mandapa in front has lost its roof. The sculpture on the outer walls of the shrine are Shiva Harihara and Ardhanarishwara. The temple of Papanatha is a little to the south of the Virupaksha temple, also facing east. It was built probably in about 680 A.D., in Northern style. According to the inscriptions, the sculptors Baladeva and Changana constructed the temple along with Revadi Ovajja. The temple was originally intended to be dedicated to Vishnu who appears on the ceiling of the Nandi ‘mandapa’ as Seshashayi, but was later tuned over to Shiva. This temple also consists of walls, a porch, a columned hall, an antechamber and an ambulatory. The figures guarding the hall are very badly damaged. The lintel on the ‘mandapa’ doorway shows Gajalakshmi and Shiva with Parvathi. The outer walls have a wealth of sculptures. There is also a Jaina temple at Pattadakal belonging to the Rashtrakuta period. Besides these temples is a group of minor shrines remarkably primary, for representing two chief styles of Indian architecture, side by side. The detailed descriptions in the sculptures of temples give an insight into the social life of those days. Pattadakal is 24 kms. away from Badami which would be the ideal base for visiting these temples. A fine metal road now connects this forsaken abode of art with Badami railway station. Badami town is connected by rail and road. Regular bus services operate from Badami to Pattadakal. Taxi or autos can also be hired from Badami at reasonable rates. Badami has good rest Houses and excellent lodgings for overnight stay.